Blue Pages: Facebook to become the world's biggest phone book? Facebook has confirmed it is working on an Android dialer app called Phone, which is heavily rumoured to be capable of blocking unsolicited phone calls. Facebook confirmed the apps existence to Venture Beat but didn't reveal any more details, merely stating "we are always testing things and have nothing to announce at this time." A screenshot taken by Android Police shows the download link to the app that is currently restricted to Facebook employees only. Trying to download at that stage brings up an error message but reveals the description of "shows you info about who's calling and automatically blocks calls from commonly blocked numbers." It's an interesting concept and blocking unsolicited calls is a big ask from Facebook, but if it can get it right it would no doubt find itself in a lot of people's good books. Facebook has almost 1.4 billion users, many of which have their phone number saved in their profile details, meaning the app may be able to supply you with details of people you don't even have saved into your phone. There isn't any confirmation from the company that Facebook Phone will be released to the public, but we like what we've seen so far. 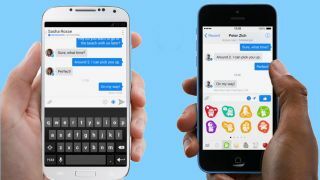 Facebook is planning to turn its Messenger app into a WhatsApp competitor.